Canyoning, also called Canyoneering, involves trekking through a watery canyon, jumping into rock pools and climbing up waterfalls, and might just be my favourite outdoor activity of all time. With dozens of canyons and waterfalls (and canyoning companies), Cebu Island is an ideal first introduction to canyoning under the safety of a guide and helmet. Kawasan Falls and its two public rock pools is located on the west coast of Cebu Island 25km south of Moalboal. It’s fantastic for canyoning novices because there are an abundance of canyoning guides to show you the ropes, provide you with helmets and life jackets and take you on a route through the canyon suited to your comfort level. 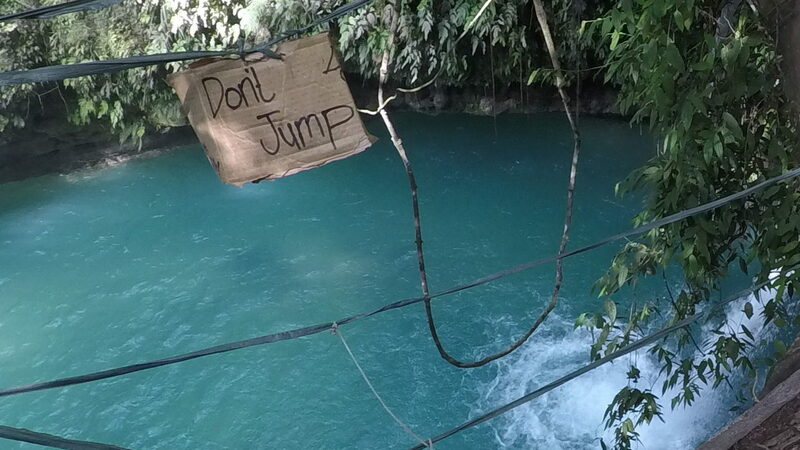 Canyoning is not suitable for very young children, but Kawasan Falls is also accessible via a 2 km walking path, so one parent can walk from the parking lot to the falls with the young children while the other goes over the mountain and canyoneers down the falls with the older kids. You can rendez-vous at the second falls, which are much less crowded and easier to find each other than the first falls. The falls themselves are not particularly noteworthy or extraordinary. There are two 8-10 metre public falls with a rock pool where people can swim and take rafts under the falls. These two public pools are surrounded by busy restaurants and swarming with tourists. But the walk through the jungle is easy for small feet (our three-year old walked the whole way by herself, but with mom gripping her hand through all of the slippery parts) and the pools offer refreshment at the end of the hot journey. The canyoning is quite good, but busy. A good guide is important so that you can escape the crowds and go your own route. We saw tour groups with people of all ages — from 8 to 60 years old. You have to be comfortable on the back of a motorcycle (it’s a rocky 10 minute journey on a dirt road to arrive at the top of the canyon), firm on your feet (rocks + water = slippery) and unafraid to jump into rock pools (it took a few minutes for my 14 year-old stepson to muster up the courage for his first unavoidable jump), but very doable. At the end of the 2-3 hour canyoning experience, you can reunite with your younger family members at the second pool and eat fried chicken as you watch the brave make their final leap into the rock pool while the less brave raft around.